Picture the explosion of cheers after a buzzer beater, and the disbelief when the scoreboard reads in your favor. Now, picture that one second later, that joyous disbelief slips into horror, as you watch the game’s hero, your teammate, your brother, collapse on the hardwood. Put yourself in the sorrow saturated hospital hours later where that once lively athlete, who roped in the win, is pronounced dead. This is Mitchell Leonard’s reality. On March 9, 2011 when tragedy cruelly struck in the small town of Bloomingdale Michigan, a herculean display of courage and strength followed. Wes Leonard (‘12), Mitchell’s younger brother and basketball teammate, collapsed on the court and died of an enlarged heart moments after he scored the game-winning basket to secure his team’s perfect season. Fast forward to one week later, and his teammates found themselves back on the court. They were missing not only a key player, but a teammate and a friend. Wes’ older brother Mitchell not only supported his team, Fenville, in a big win against Bangor High School to maintain a perfect record and secure a spot in the district championship, but he did it the day after Wes’ funeral. Mitchell sat on the bench throughout the tournament, went to the practices, and spent time with the team at school and in the locker room despite his devastating loss. The display of strength wasn’t in the athletic victory after a tumultuous week of tragedy; it was in Mitchell’s ability to keep his commitment to the team through mourning the loss of his brother less than a week earlier. Mitchell faced an inner struggle, a moral dilemma of sorts. He demonstrated an athlete’s choice between the importance of sports versus other aspects of life. Athletes find that sports consume massive amounts of time, dedication, and commitment, and with this comes difficult decisions. Immanuel Kant theorized that human morality is based on a standard of rationality labeled the Cognitive Imperative, which drives our decisions based on reason. But questions of morality are often complicated and the line between the rational and the irrational choice blurs sometimes to the point of invisibility. When morality and ideals come into conflict with sports there is a friction created and the decision becomes harder to make. Mitchell’s story is an extreme case. In his life, sports became a therapeutic part of his tragedy because his family and his sports were interconnected. They eventually conflicted, forcing him to decide which was more important: missing his game to take time for himself, or being there to support his teammates. However, Mitchell represents not only the extreme spectrum of dilemmas, but also how all athletes are sometimes confronted with choice. Several athletes at Palo Alto High School have found themselves faced with a decision to choose between athletics and other obligations. Shaikh Haris Sultani ('10) played on both the football and track team while at Paly. 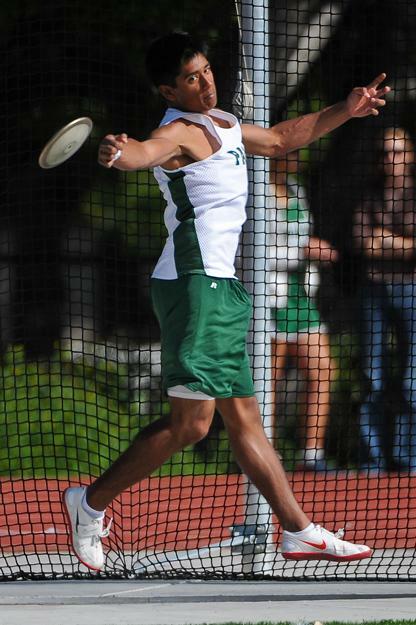 Today, Sultani helps coach the Paly track team alongside attending Foothill College. Let’s flashback to 2008, the junior year of Shaikh Haris Sultani (‘10). Sultani, a Paly alumnus and former football and track athlete, was forced to make a compromise between moral integrity and athletic obligation. At times, he struggled to balance the sports in his life along with other commitments. Sultani, a devout Muslim, was celebrating Ramadan during the Paly football season. The holiday requires fasting from sunrise to sunset, which left Sultani unable to drink water and eat throughout the entire day. This became a 30-day challenge in which Sultani’s faith was truly put to the test. While some, when faced with a similar challenge, would choose just one path, Sultani found a way to satisfy both of his commitments. Sultani would wake up early to eat breakfast and hydrate in preparation for a long day of self discipline. Although there was a legitimate health risk involved in playing without a day’s worth of water or food, he decided to keep both his moral beliefs and his athletic role prominent in his lifestyle. On top of planning out his day completely, just to assure enough sustainable nourishment, Sultani had to resist the temptation of the alluring water cooler throughout football practices in the mid-afternoon heat. Sultani’s family respected his decision, but put no pressure on him to strictly follow his religion. They trusted him to be as devout as possible while maintaining the other facets of his life. Sultani was trusted to make the right decision, and because he would be independent once off to college, his parents granted him the freedom to choose. In Sultani’s life, he struggled between sports and religion. But Sultani did put his health at risk. By choosing to play without any water or food, Sultani was left vulnerable and could have even fainted. This, however, isn’t the first time that Paly has seen an athlete prioritize a sport over health. Meet Davante Adams (‘11), one of Paly’s wide receivers and a key leader on the CIF state championship-winning football team. But during the championship game, something went awry. While going up to catch a touchdown, Adams was tackled in mid air, landing on his ankle. For anyone who viewed the instant replay, which showed several times on live broadcast of the game, it did not seem like a minor injury. Adams later jokingly commented on how it was painful enough the first time. 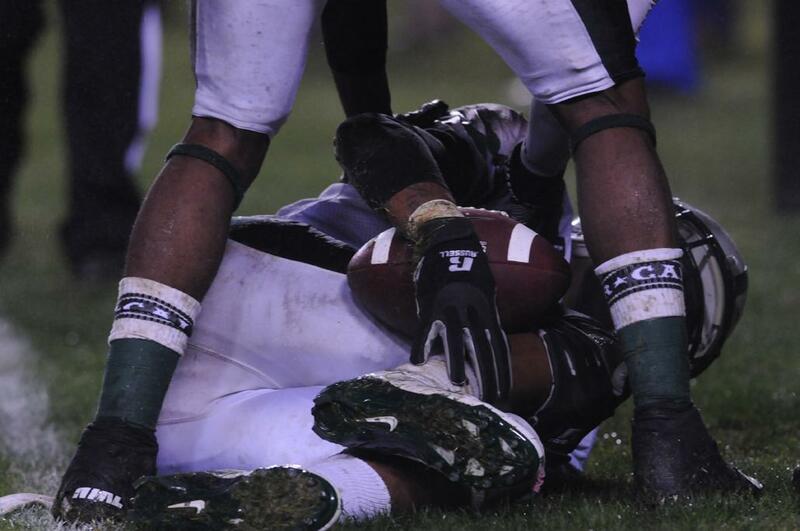 Wide reciever Davante Adams ('11) grabs ahold of his sprained ankle during his CIF State Championship football game. Despite his injury, Adams continued to play through the pain and Paly upset their opponent, Centennial, 15-13 to take home the state title. It looked like his ankle snapped in half. In fact, had the grass not been wet, it probably would have. But Adams was lucky, only sustaining a high ankle sprain. Thanks to a little rainfall, and a determination to compete, Adams was able to re-enter the game, and help bring home Paly’s first ever football sate championship. Knowing how important the game was, Adams mustered up the strength to continue despite the pain and further health implications down the road. In addition to prioritizing the team over health in the state game, Adams, who would later go on to lead the varsity boys’ basketball team to a league championship during the winter season, also knew that his loyalties were stronger towards the sport of football than to basketball, another rationale for his continuation of play. Adams compromised his health because he knew the magnitude of the honor that a state championship title could bring. In his perspective, playing in the game was more important than his injury. Moreover, he chose to put his basketball career on hold as he played through his football injury. In Adams’ case, health played a serious role in his decision to place sports above other factors of his life. Although others might not have been as risky, Adams took the risk and won the title. But health is not the only factor in important sports-related decisions. Sports spills out into other areas of peoples lives, including academics. But smaller scale decision that athletes have to make take place regularly and don’t always involve dramatic health decisions or championship games. Sometimes, the choice is a daily occurrence, a struggle of prioritization. There is a common saying in the sports community, “school then sports,” meant to outline the hierarchy of priorities athletes should have. But often, these two commitments conflict, and the true importance of obligations is tested. In the life of Paly student Sara Billman (‘13), a nationally ranked competitive ice skater, there is virtually no time for breaks. Billman, who has been skating for 13 years, wakes up at 3:30 a.m., laces up her skates at 4:00, then heads to school after her practice ends at 7:00. After a six-hour school day, she gets her homework done just in time for another round of skating in the afternoon, or on other days palates. Sarah Billman ('13) laces up her skates for a 4:00 am practice. In Billman’s life, she encounters a struggled balance between school and sports every day. She skates for the Peninsula Figure Skating Club at Ice Oasis in Redwood City. In addition to her rigorous daily skating routine, her talent has allowed her to travel for competition, from locations such as Las Vegas and Salt Lake City, to Belgium, and recently Luxembourg. Sometimes she places her skating competitions before school when she misses class to compete out of state. Billman looks for skating to be prominent in her future. Skating has shaped her entire schedule, both athletically and academically. For next year, Billman is unsure of how many Advanced Placement classes she will be able to take due to her sports commitment. But she hopes that all of her hard work in high school will take her to the next level as she gets older. Billman’s sport has caused her to adapt a schedule that balances both her academic life and athletics. Similar to Billman, Paly student and dancer Noa Dagan (‘11) has dedicated much of her time to her sport. Dagan spends anywhere between 15 and 20 hours of time dancing each week. Like Billman, she must juggle her school workload with her practices. She realized where dance fell on the spectrum of priorities when choosing which colleges to apply early decision to. Although she kept dance in mind, academics took precedence. Dagan found clarity in her college decision, and found the middle ground between her best academic fit with a place that will allow a continuation of dance. However Dagan does find conflict when family activities are scheduled. This is a consequence of Dagan’s commitment to dance, and just one example of how family events can clash with sports. Whether parents, siblings and other relatives are supportive or not, family life can factor into an athlete’s commitment. Families hold different values, with sports being just one of many. Others, however, find sports to be an integral component of their lifestyles. Welcome to the Whitson household, where sports are a major part of the family dynamic. 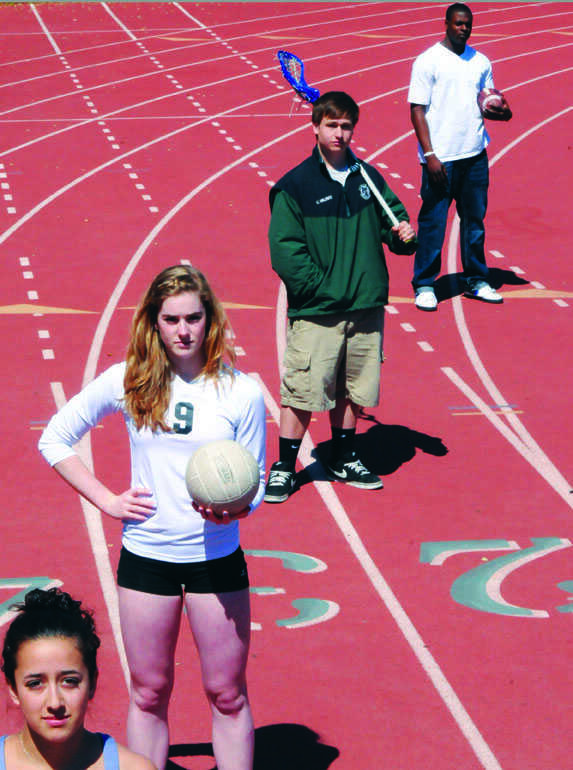 Kimmy Whitson (‘12), setter of Paly’s varsity volleyball squad, cherishes support from her mother, father and sister. Her family surrounds itself with sports. Kimmy’s parents immersed themselves into the world of volleyball. Ali Whitson (‘09), Kimmy’s older sister and Paly alumnus, currently plays volleyball for UC Davis. Her father, Bruce Whitson, announced for both Kimmy and Ali’s volleyball teams. In addition, Debbie Whitson, Kimmy’s mother and a Paly teacher, is frequently seen at Paly games in support of her daughter. Mrs. Whitson feels that sports are prevalent in both of her daughters’ lives. Jokingly, Whitson commented that if a big game and a family obligation came into conflict, the whole family would just go to the game together. However, in terms of priorities, sports do not necessarily come before family. Kimmy, who has already committed to play for University of the Pacific, will follow in Ali’s footsteps by playing at the college level. Whitson and her sister have bonded through the sport of volleyball as well as other aspects of their lives. Ali, who played volleyball in high school, was an outside hitter for Paly. Kimmy, the starting setter for this year’s team, led the Lady Vikes to a CIF State Championship in December. Kimmy looks to her sister as an athletic role model. As Kimmy progresses through a higher level of play, her priorities might change. When Kimmy walks in the footsteps of her sister by playing volleyball in college, she recognizes that the role of volleyball could increase in her life. 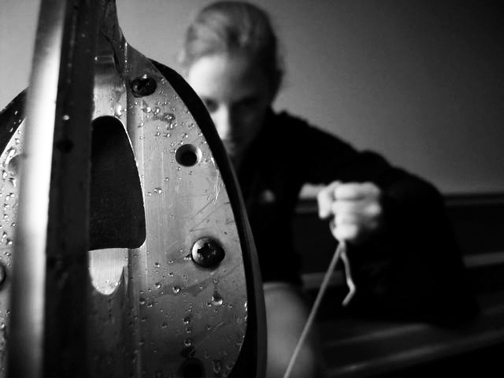 As the level of sport becomes more competitive, so does the commitment and the intensity. Sports can take on many roles in a person’s life. For Whitson, it could change from all fun and games to work as she advances to college. But then on the flip side, there’s Mitchell, who used his sport as a comfort to diffuse the pain in his life. Even the athletes who allow passion for their sports to drive their decisions are examples of how sports influence people’s lives.